There’s nothing quite like settling down to enjoy a good ol’ fashioned musical, replete with comedy, budding romance, and lots of dancing. 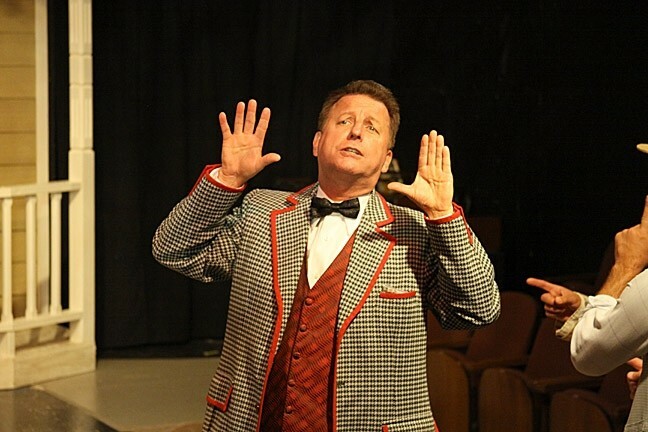 That’s the experience you'll get watching the SLO Little Theatre’s performance of The Music Man. SMOOTH OPERATOR: Con man Harold Hill, played by Chad Stevens, arrives in the quiet town of River City and immediately starts to rile things up. The play, written by Meredith Wilson and directed and choreographed by Zach Johnson, follows the exploits of fast-talking con man Harold Hill (Chad Stevens) in the little town of River City, Iowa, during the Progressive Era. Hill is preparing to run a long con on the town’s residents, posing as a music instructor on a mission to form a children’s band. He plans on taking down orders—and money—for instruments and uniforms, before skipping town. But his plan hits a snag when he runs afoul of Marian the librarian, who also teaches piano lessons on the side. Tempers flare, songs are sung, and the two eventually fall for each other, just as the whole town discovers Hill’s scheme. It’s hard to choose one standout performance from the excellent cast, but Lacey McNamara—who also did the musical direction—was picture perfect in her role as the prim and proper but incurable romantic that is Marian. It’s hard to make a character that acts so bent out of shape in the first act seem likable, but McNamara balances out the character’s seething distrust of Hill with caring warmth. Not to mention, McNamara’s high, clear soprano voice that would make Snow White weep with envy. Her rendition of “Till There Was You,” where she finally declares her love for Hill, was absolutely incredible, and it completely cemented my belief that birds actually do come to dress her every morning while she sings. Her chemistry with Stevens’ Harold Hill was also a joy to watch, especially during the song “Marian the Librarian,” where Hill causes rampant mischief in the library during an attempt to woo her. CHORUS LINE: Harold Hill (Chad Stevens) and Marian the librarian (Lacey McNamara) dance the night away at the River City ice cream social. Another arresting performance was that of Andrew Miklas as Winthrop, Marian’s towheaded, lisping younger brother. At the start of the play, Winthrop is the portrait of melancholy: He mopes around stage with a hangdog expression reminiscent of Charlie Brown, unwilling to say anything because of his extreme embarrassment over his speech impediment. But with the help of self-possessed Harold Hill, who immediately recruits the boy into his “band,” Winthrop eventually comes into his own, much to the delight of Marian. He even gets a couple of solos in, with “Wells Fargo Wagon,” and “Gary, Indiana,” which is probably the most frustratingly catchy song in the whole play, aside from “Seventy-Six Trombones.” But it’s worth getting that song stuck in your head for the next three weeks just to watch Miklas break out into joyous song, gamboling about the stage with a wide-toothed grin. In fact, it was heart-wrenchingly adorable. It’s always great fun to see the creative ways that the SLO Little Theatre utilizes its space, and The Music Man is no exception. The set pieces were all resourcefully employed, particularly the rolling seats that the actors moved across the stage to represent the movement of a train. The costumes were also remarkable: The actors were decked out in colorful seersucker jackets, knickerbockers, and frothy lace gowns characteristic of the time period. And while there were some moments where the music drowned out the singing of the actors, these were few and far between, and did nothing to detract from the overwhelming fun of the performance. 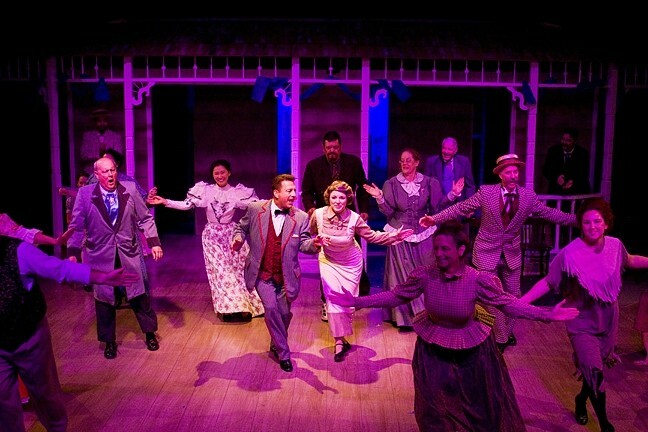 BRAZEN OVERTURES: The Music Man is running at the SLO Little Theatre through June 14. For more information about show times and ticket prices, visit slolittletheatre.org. Intern Adriana Catanzarite never watches her phraseology, ye Gods! Send her new catchphrases via Interim Arts Editor Hayley Thomas at jpena@newtimesslo.com.